If you live in or around Narberth you may have been fortunate enough to join the wonderfully named Cheerful Project at some point over the past few years, if not there’s still time. Run by Span Arts, the Cheerful Project has brought creative activities and events to our corner of Pembrokeshire. Such as, the Queen Bee procession at Narberth Carnival, Pushing Up The Daisies (festival of living and dying) and the spectacular River of Lights lantern parade in Haverfordwest the past three Octobers. Every month they host a Skill Share at Maenclochog Community Hall, on a pay-what-you-can basis. On Wednesday 7th March, 7-9pm, I will be sharing my milk kefir and kombucha making skills – book your place now! It will be an evening of tasting and a chance to have a go at making both drinks. Participants will be able to take home some starter culture for kefir and kombucha, with the knowledge and experience to begin fermenting at home. The bacteria in kefir offer a number of health benefits – similar to those in ‘pro-biotic’ foods. These include, boosting the immune system in response to some disease microbes, breaking down cholesterol and reducing the formation of some carcinogens. As kefir ferments milk lactose, changing it into lactic acid, some people who can’t tolerate milk due to lactose can drink kefir. Anyone introducing fermented foods into their diet is advised to start with small quantities to test for tolerance and gradually introduce the new bacteria present in fermented foods. For these recipes you will need some milk kefir ‘grains’, the starter culture for fermenting milk into kefir. Kefir grains grow regularly, and I am happy to share my surplus kefir grains, or you can buy kefir kits from health food shops, try The Ark in Haverfordwest (for Pembrokeshire-folk). 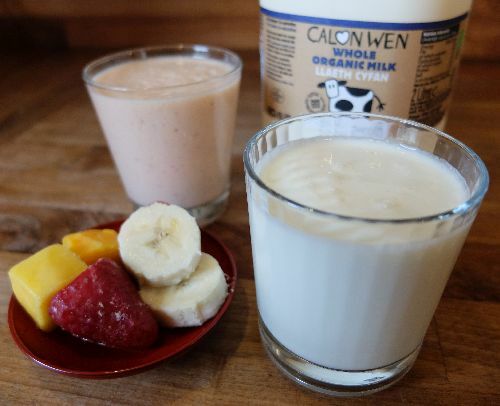 In my experience kefir grains are most active in organic whole milk, I use milk from Narberth-based farmers co-operative Calon Wen. However, organic raw milk is ideal, for supplies try Mountain Hall Farm or Caerfai Farm, both in Pembrokeshire. Due to UK food regulations raw milk is only available to buy directly from the farm, visit Raw Milk for farms selling raw milk in England and Wales. Kefir can also be made with goat’s milk and milk alternatives such as coconut or oat milks. Mix the kefir grains in a glass or ceramic container (not metal or plastic) and cover loosely to stop flies/dust getting in. Leave at room temperature for 24-48 hours until it has thickened to the consistency of yogurt (time will depend on temperature, 20c is ideal). The kefir grains will rise to the top and should be easy to scoop out with a fork. Then pour the kefir into a glass, pouring through the fork tines to catch any remaining kefir grains. The kefir is ready to drink, it tastes tart/sour and may be a little effervescent. Repeat process and drink regularly to promote healthy gut bacteria. … to catch any kefir grains. Kefir can be quite an, ummmm, acquired taste. To make it more palatable, or just for a change, you can use kefir in other recipes. It can be used in place of yogurt in many recipes and you can make your own soft cheese too. Here are a couple of ideas to get you started. Put all the ingredients into a jug/blender, blitz with a hand blender/food processor until smooth. Pour into glasses to serve. To make ice-lollies – pour smoothie into ice-lolly moulds, freeze until solid then serve. A large glass or ceramic container (not metal or plastic), something to cover it with, a large glass or ceramic bowl to collect the whey, a muslin cloth/tea towel to drain the curds and whey (sterilised in boiling water, then wrung out when cool enough to handle), a clip or colander/sieve for when draining the curds and whey. Place kefir grains in the jug, pour over milk and stir. Cover the kefir to keep dust and pests out. Leave it for 2-4 days, let time do the work! 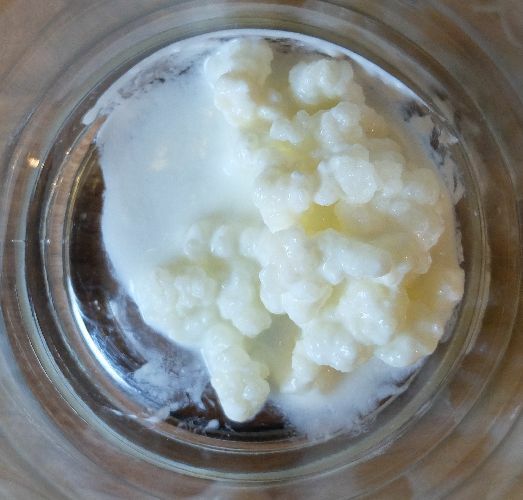 After a day you should see some change in the kefir, it should have coagulated and may begin to separate into curds and whey with the kefir grains floating to the surface. By days 2-4 the curds and whey should have noticeably separated, with the curds above the whey. The length of time will depend on the room temperature. Line a bowl with a sterilised muslin cloth, clean tea towel or similar. Remove the kefir grains with a fork or by hand, most will have floated to the surface but some may be in with the curds – use your hand to feel for them and take them all out. Pour the kefir curds and whey into the cloth lined bowl. Elevate the cloth and curds so the whey drains into the bowl (see photos below) or you could drain through a colander/sieve. Leave for 6-12 hours until it reaches the consistency you want. If the room is warm you may prefer to drain the curds and whey in the fridge. The cream cheese is ready when it reaches your preferred consistency and is now ready to eat. You can eat it as it is, add salt or sugar to taste or use as an ingredient in another recipe. The whey is also a great addition to soups as a stock, can be used to make smoothies, and to make bread. The cream cheese and whey will keep in the fridge for a week and can also be frozen. … the kefir grains will mostly float to the surface. … for the curds and whey to separate sufficiently. 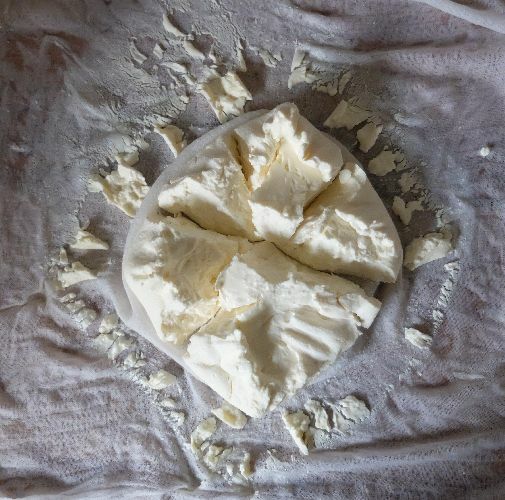 … if the room is warm you may prefer to drain the curds and whey in the fridge. Anyone who grows their own fruit and veg will know the joy of eating just picked fresh produce. And also the monotony of gluts..! Now is a perfect time of year to hole up in the kitchen for a preserve making session, with your own glut or seasonal produce which is cheap and plentiful. The sweet, vinegary, spiced tang of chutney sparks up a sandwich and stirred into a stew can really lift the flavours. With whatever fruit and vegetables you have, use a rough ratio of 4:2:1 of fruit&/vegetables: sugar: vinegar. You will need 6-8 500g jars, or to equivalent capacity if different size jars. If re-using old jars ensure the lids are vinegar proof inside, i.e. with a plastic coating and seal. Sterilise the jars and lids in a dishwasher OR wash in hot soapy water and dry at a low heat in the oven (120C/Gas 1). Cooked chutney should go into warm, sterilised jars. 1 – Peel any fruit and veg with a tough skin, cut out and discard any bruised bits. Chop fruit and veg into even sized chunks. Small chunks will cook quicker and may break down into a mush, larger chunks are more likely to retain their shape, mix and match to suit your preference. If you are using large dried fruit, chop these into small pieces. 2 – Place the fruit &/ veg into a large, high-sided pan, add the spices, salt, pepper and vinegar and simmer for about 20 minutes or until the fruit and veg softens (a knife/skewer slides in). 3 – Turn the heat down, add the sugar and stir to mix well, stir until the sugar dissolves. Simmer for 30mins-1hr until the chutney is thick, stir occasionally to ensure the chutney doesn’t stick to the bottom of the pan. 4 – Use a clean jug or ladle to pour the hot chutney into the warm, sterilised jars and tighten the lid onto each jar. Store the chutney in a cool dark spot for a month or two, up to a year, once opened refrigerate and use in a month-ish.